SALEM — Sixth-grade students in the Salem Middle School’s 21st Century afterschool program meet regularly in the school’s cafeteria, where just outside their window, an ugly abandoned building looms in plain sight. It’s a beige, multi-level structure with knocked out windows and chipped paint, remembered by residents to have been a car dealership decades ago — certainly not something anyone would want to have to look at on a daily basis. “It’s ugly. It needs a lot of work,” said sixth-grader Delorian Lewis. Though demolition funds to knock down vacant buildings in the city are tough to come by, the students in 21st Century came up with one idea to at least make the structure less of an eyesore. With some outside help from the Girl Scouts of Central &Southern NJ’s Take Action Program, the students are painting a mural to hang in the windows of the building. “We were invited into the school to do a Take Action project, and we asked the students what they would like to do or fix-up in their community,” said Rona Whitehead, a leadership specialist with the Girl Scouts of Central & Southern NJ. View full sizeStaff photo by Britney LillyaThis eyesore building across from the Salem Middle School will be improved by murals painted by students. 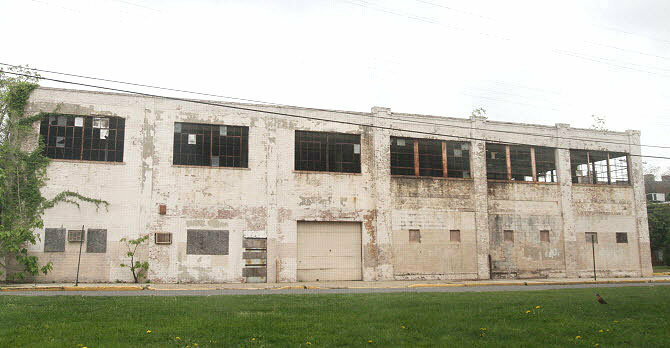 Whitehead said in speaking with students, she found that they really didn’t like looking at the ugly abandoned building, which is located just across from the middle school on New Market Street. Since the building is owned by the city, Whitehead worked in partnership with Salem Main Street to get permission for the mural. After a few weeks of research, followed by brainstorming and design sketches, permission was given to install the mural in its windows, where students could see it and take pride. “I think the students can be proud of themselves when they look at it, and that they went through all the different steps and took action,” said Whitehead. The mural is being painted on wood panels, which once assembled, depict people holding hands around the symbolic Salem Oak, a landmark in Salem City. 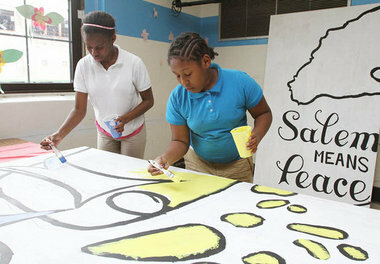 Students are currently in the process of painting the mural, and the group expects to complete it sometime next week. Once the mural is hung, Salem Main Street Executive Director Chris Davenport said he has received permission from the city to have the abandoned building re-painted if Main Street can come up with supplies and volunteers. Salem Middle School Vice-Principal Mary Benatti oversees the 21st Century program, and said she is very proud of the students’ efforts.